I have mixed feelings towards making patchwork quilts. I enjoy the history and tradition of the art and it does appeal to my perfectionist tendencies. Ironically, these are the same things that can contribute to my more ambivalent feelings toward this type of work. Sometimes the number of traditional patterns generated makes it feel harder to do something new or unique. This, of course, is not true as talented designers are constantly created new approaches and new variations. And as to the satisfaction of perfect precision piecing, it can be a hurdle to cross if there are too many pieces since getting them perfectly matched can make for a time consuming process. 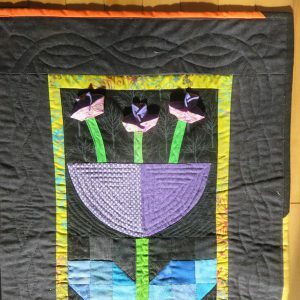 With these opposing views, I usually alternate between more traditional pieced designs and freer approaches, focusing more and more on art quilts, though I do apply learning from patchwork approaches. When I do do patchwork, I usually favour less rigid designs with fewer matched sections, like this one I made for my nephew a few years ago. It is based on a traditional log cabin designed but uses different size strips and uneven angles. 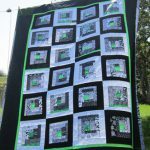 I called it “Wonky Squares” and used strong patterns with only a hint of lime green tones, his favourite colour at the time. I hope that this is a combination that has staying power and is ageless. Perhaps he will be able to take it to a university dorm room when he gets older. Creating squares with random strips of different sizes. 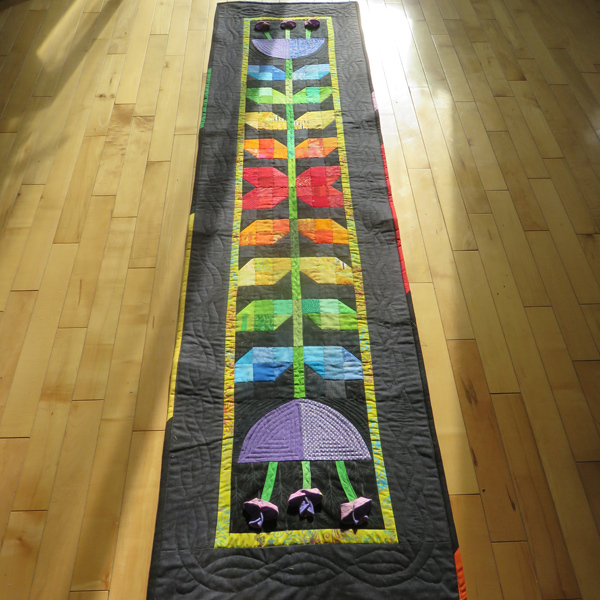 My newest pieced work is a table runner that I finished just this week, my Cutting Garden by Night. I started it in a workshop in the spring with Krista Hennebury. Krista is very good at combining traditional piecing with modern touches. I wrote about her Improv Under the Influence course in a recent post (Colourful Finishes ). I am working on a goal of finishing more of my works in progress. The pattern for this class is called Cutting Garden and is available at Krista’s Poppyprint Pattern Shop. It is a lovely design and a great choice for using scraps from your stash. I decided to do a table runner rather than the full wall hanging and chose to do a black rather than the light value background recommended in the pattern. I love the way that the black makes the colours pop for a dramatic impact. I also changed the flowers to include some folded flowers. 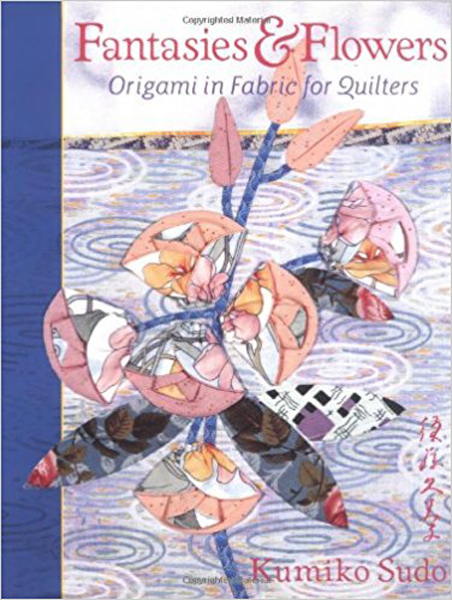 a used book store with exercises by Kumiko Sudo (Fantasies & Flowers: Origami in Fabric for Quilters). The flowers that I have done are not a realistic representation like Kumiko uses. They are just a fun variation inspired by some of Kumiko’s patterns. 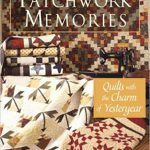 Since I am in a patchwork frame of mind AND on a path to more finishes, it might be time that I revisit an earlier patchwork pattern. 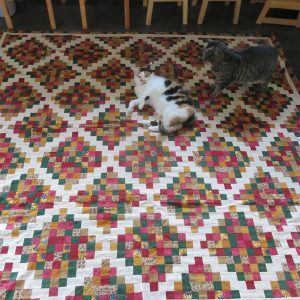 This project was my second quilt and my first machine pieced effort. 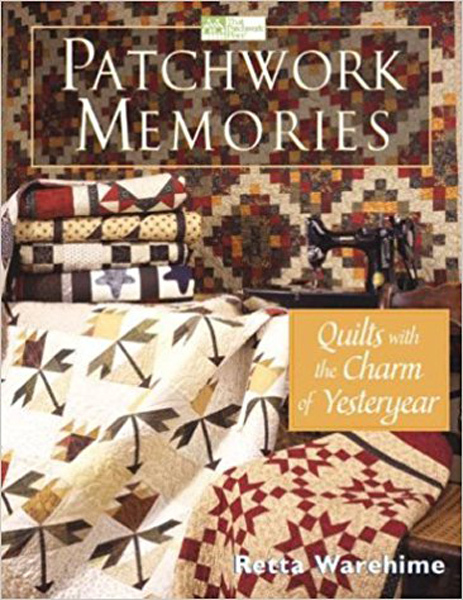 I used a pattern called Carolyn Ann’s Present from the book Patchwork Memories by Retta Warehime, one of only a few books that I have ever purchased with patterns. 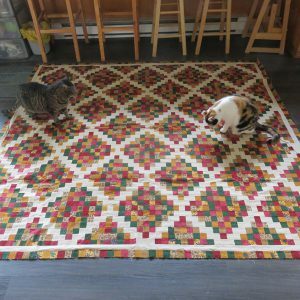 I was new to quilting and a staff member at the local quilting shop advised that projects with lots of small pieces are a good place to start because mistakes are not as obvious. I can’t believe that I bought that even briefly as it doesn’t make much sense – more small pieces obviously means (lots) more cutting, more piecing and, in my case on this project, more unpicking when things didn’t fit precisely. Obviously it was the first time that I used strip piecing and my strips left something to be desired. But I did like the pattern and persevered. Eventually, I learned that it is OK if not everything fits perfectly in the corners and did less unpicking, finally making some progress. I finished the blocks and put the blocks in strips. But I still noticed the imperfect piecing and was never really happy with it. Following the strategy to put it away for a bit and return to it when ‘mistakes’ would be less obvious, I folded it up and put it away in the to-be-completed-someday cupboard. That was more than 10 years ago. Earlier this week, I spread it out on the floor with plans to revisit. 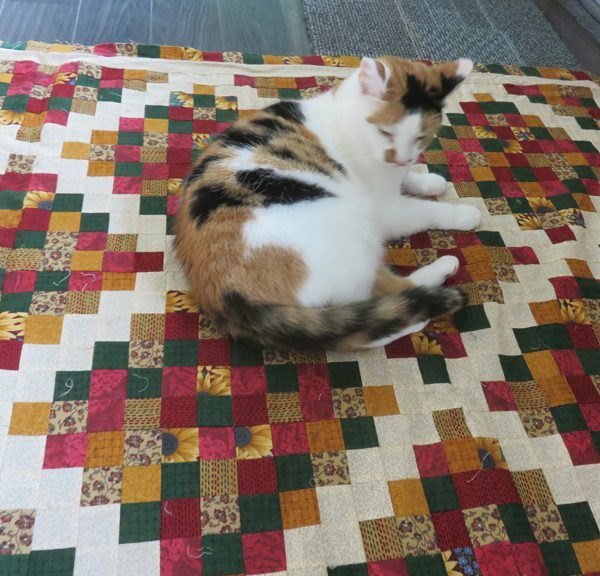 My chief quilting inspector – and her new assistant – didn’t seem to mind that they blocks don’t all match perfectly. And, although I still notice that it is not pieced as well as I would do it now, it doesn’t seem as glaringly obvious that it doesn’t match. Besides, your earlier projects are supposed to show progression, right. I think that it is time to put on a boarder or two and get it quilted. Sasha and Luigi seem to approve. I still like the colours and the pattern. Piecing imperfections seem less obvious after all this time. 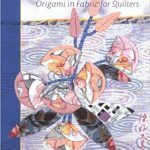 This will be a perfect project for another visit to Songbird Quilter to do some more longarm work (Read about my earlier adventure with Wendy at Songbird Quilter). And looking at this one, I am again inspired by the pattern and thinking it might deserve another visit because I have learned lots about piecing since that earlier effort. I’m seeing pinks and browns. But I’m not taking on any new bed-sized projects until I clear a few more off the list. 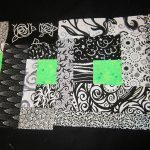 Strip piecing tips and techniques – includes other short cuts for patchwork. 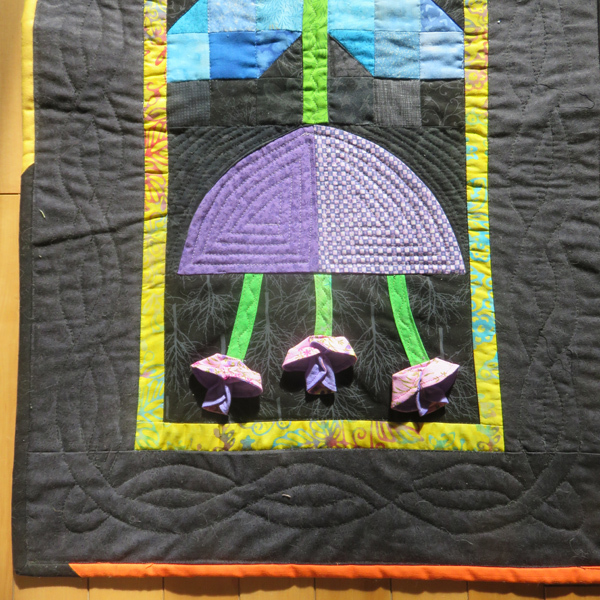 My First Quilt from QNN – QNN has 2000+ videos on YouTube for quilters of all levels. 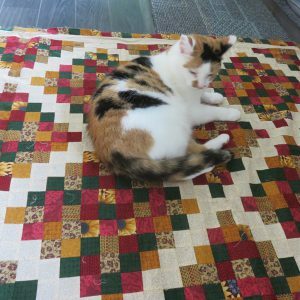 This playlist focuses on basic skills and specific blocks, with tips that apply well beyond a first quilt. Power Cutting Tutorial – Proper cutting is imperative for precision piecing. People have different approaches. Here is one comprehensive demo. Patchwork piecing is a time-honoured tradition with many inspirations and designs. It is possible to make elaborate designs with many small pieces or to showcase large print fabric with big blocks. Whatever type of patchwork you choose, it is always fun to customise a pattern and make it your own with little touches. Changes can be simple like your own colour combination or much bigger variations in the line or form, often straying so far as to make the original design hardly discernible in the finished project. It depends on what patchwork stories you want to tell. 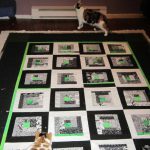 Share your thoughts on patchwork quilting – and post pictures of some of your favourite projects.